I’ve been sketching. My niece, Grace, finished the November challenge of writing fifty thousand words for NaNoWriMo and then decided she wanted a new challenge for December. She’s doing a sketch every day and she invited others to join her. I didn’t immediately jump on that bandwagon because I didn’t even hear about it until the second or third of the month, so I figured it was too late. Then she published a blog post where she suggested that others who wanted to join the challenge could just start with the day they saw that post and continue through December thirty-first. I still didn’t officially say, “I’m in,” but I did draw that day. That was the day I drew the leaf I showed in my last blog post. The next day, I had an evening Chorale concert with a four o’clock rehearsal. I knew there would be some time in between when I would be sitting around and waiting, so I threw my sketchbook and my watercolor pencils into my Chorale bag with my music. When the time came, I was in a dressing room which had absolutely nothing in it that looked as if it would be fun to draw. 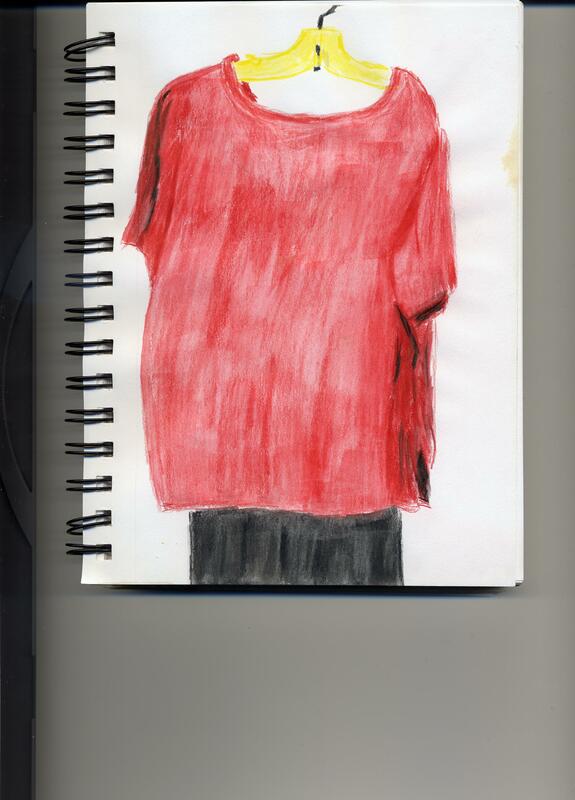 I ended up drawing a red top and black skirt that were hanging in an open closet. You can see that I was not really enjoying that drawing, but I did draw. That was two days in a row. 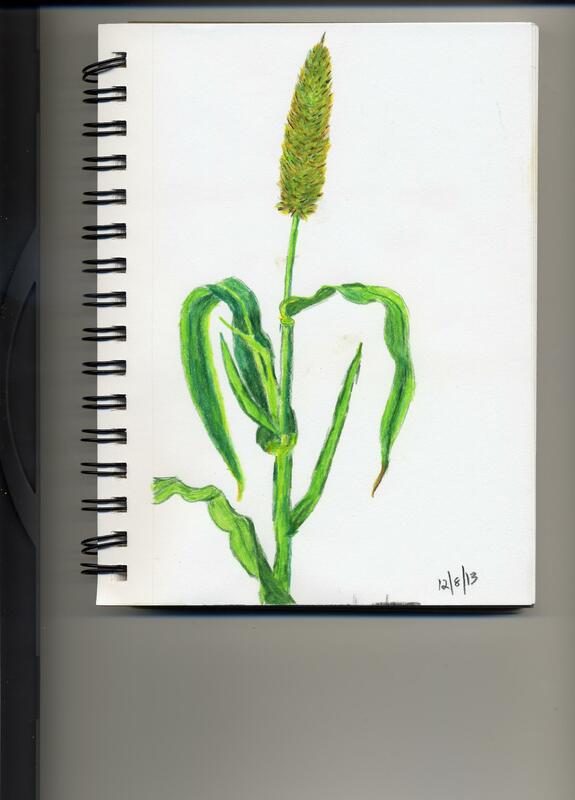 The next day, I found something more fun to draw – a plant growing near our bird feeder. The birds planted it, so we’re not sure what it is, but I did enjoy drawing it. 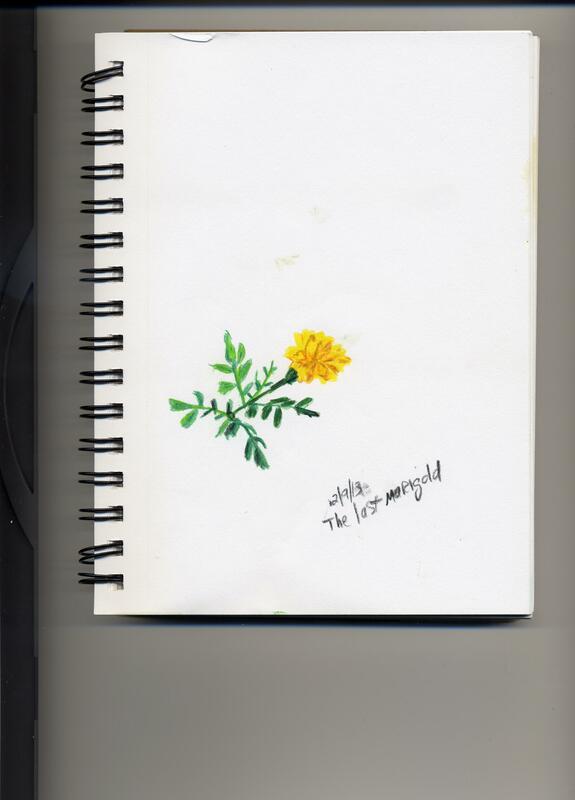 The next day, I drew the last marigold. Green things go well; yellow things, not so well. 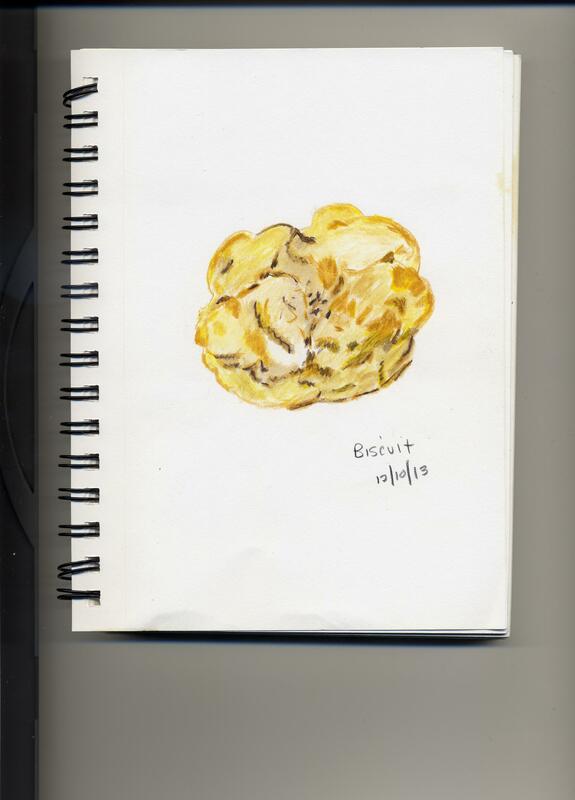 I only have one yellow in my box of twelve watercolor pencils, so shading is a problem. I still enjoyed it more than the hanging thing. Then came the biscuit. I drew it because it was there. The next day, I looked in the refrigerator. 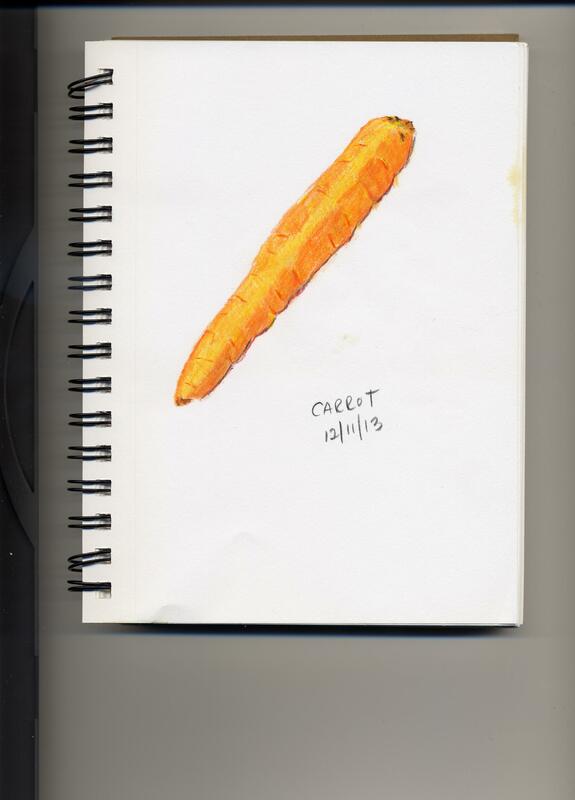 Ah…a carrot! That was fun. Another day, another trip to the refrigerator. I found a half of a tomato. 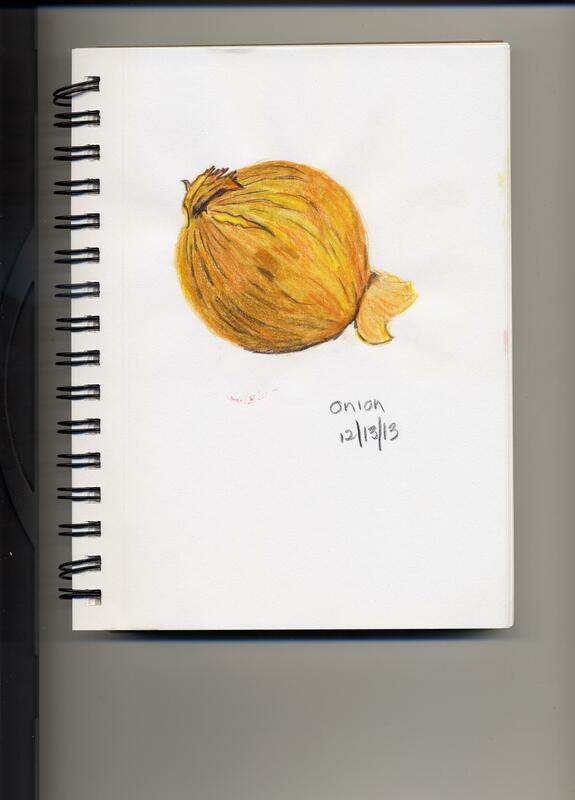 Today, I drew an onion. I’ve managed a drawing a day for a week. Maybe I really can keep this up until December thirty-first. All right, Grace – I’m in! 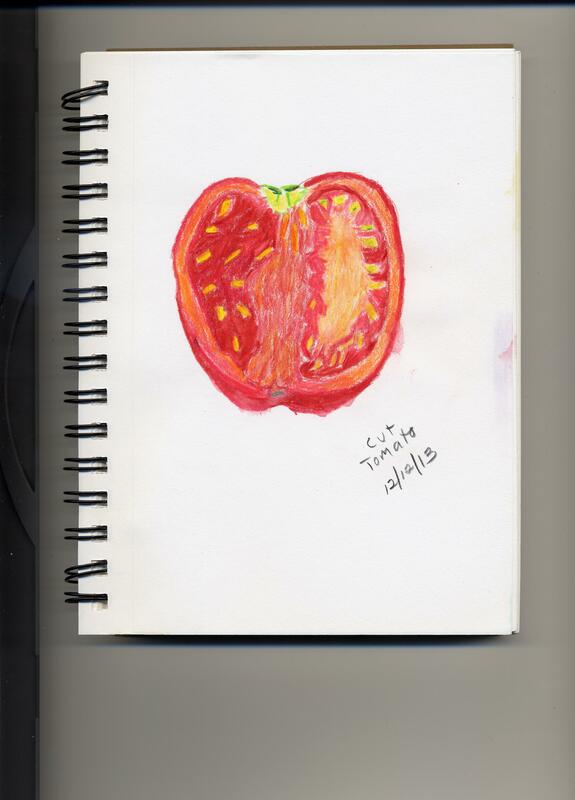 This entry was posted in Uncategorized and tagged drawing, sketching, watercolor pencils on December 13, 2013 by releaf1954.